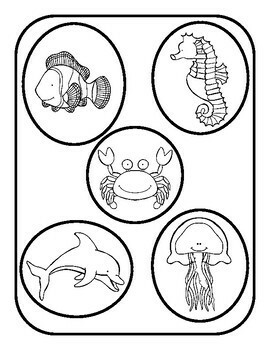 This File Folder Game addresses preschool matching skills by providing students with the opportunity to match different ocean animals in full color to the black line drawings. 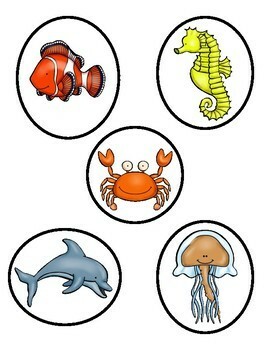 Note: Animals are in circles or oval shapes for ease in creating the file folder game. * File Folder Games are great, quiet independent activities to use at naptime with your early risers or if you have non-sleepers in your group. * File Folder Games are also useful when working with a student in a one- to- one situation, when doing drills or when targeting an individual student’s specific learning needs. 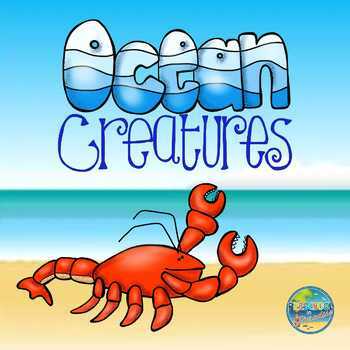 * File Folder Games provide students with the opportunity to practice skills previously introduced in a fun way. * File Folder Games are great to use to review concepts with early learners particularly those with special learning needs or Autism. 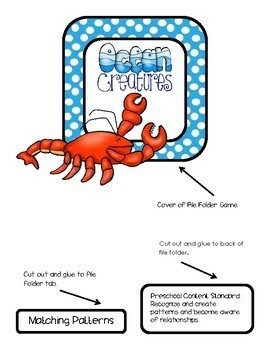 * You can send File Folder Games home with your students for a Parent/Child Activity. Directions to assemble the File Folder Game are included. If you would like to receive notifications when new products are created and added to the store, please follow us by clicking on the green star in the upper right hand corner of the screen.